The Ledbury Heritage Centre was built around 1480 as a boys’ grammar school – one can still see some of the boys’ names scratched into the glass and timber as a reminder of the past. This distinctive half-timbered building is now the town’s local history museum, exhibiting all kinds of interesting little relics from the past and housing the poetry of Ledbury’s very own John Masefield and Elizabeth Barret-Browning. Also exhibited is the Ledbury’s canal and railway past and a recent exhibit about the Abberley and Malvern Hills Geopark. There is also an interactive exhibition where one can try one’s hand at timber framing. The Tudor styled building has a good example of a jettied first floor (the second floor projecting out slightly from the lower floor, this overhangs the town drains, which proved to be very useful when it came to emptying chamber pots!). The low beams and smoke bay are typical of the timber-framing style and a small part of the wattle and daub has been uncovered to show this simple but effective method of construction. 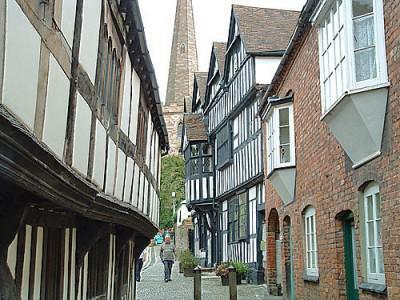 The Heritage centre is one of the many buildings in the charming Church Lane, a narrow, cobbled lane leading from Ledbury High Street to the medieval parish church. The centre is open from the beginning of April until the end of October; opening hours are 10.30am – 4.30pm daily. Location: Church Lane.